HF welding is an abbreviation for high frequency welding (also often known as Radio frequency welding (RF welding) or electrical heat sealing) is a manufacturing process where two plastic parts are welded together using an electromagnetic field. You can read more on the actual High Frequency welding process here. Plastic eyelets made of PVC (Vinyl) and a number of other materials are ideal candidates for mounting with HF welding. Plastic and PVC eyelets that are HF welded will partially melt and fuse together with the foil and create a strong and flexible bond. This is especially true when working with mesh materials – e.g. in advertising banners, sun screens or building wraps. 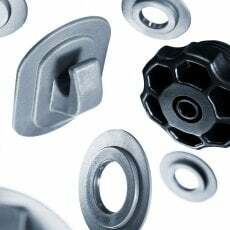 Traditional metal grommets offers no re-inforcement of the foil material and will tear from the base material under relatively low pull forces. HF Welded plastic eyelets on the other hand fuses with and reinforces the base materiel, allowing to withstand up to twice the pull strength compared to traditional metal grommets. By welding a plastic eyelet or PVC eyelet to each side of the foil, even higher pull forces can be sustained. Depending on the application, up to 3x pull resistance can be obtained. Common products manufactured with high frequency welding are tarpaulins, tents, ceilings, advertising banners, waterbeds, inflatable boats, medical and especially blod and urine-bags, tensile structures, conveyor belts, rain clothing etc. Over many years, Carmo have developed specific PVC and PVC/Polyurethane formulations with a special emphasis on HF welding performance. The material compounds are specific to the component and the applications in which it is to be used. Mechanical and thermal properties are not compromised on either. The PVC is modified for use in cold climates, however it is also UV stabilized so that it can be used in countries where there is strong sunlight. For HF welding to polyurethane (PU) coated fabrics, Carmo offers a blend of PVC and polyurethane. The reason for this is that there is a significant cost benefit over producing in 100% polyurethane. Welding performance is just as good, if not better than with pure polyurethane. Some of the eyelets are also available in polyethylene (PE) and PP (polypropylene), though these require a different welding approach, e.g. ultrasonic welding or by the application of a heated die. The principles involved are the same in each case. The electrode, component and foil are placed correctly in relation to each other. The bar welder or press then exerts downward pressure on the welding flange of the component, via the electrode, to the foil. Welding is started and controlled according to a preset time. Physically the electrode will sink slightly and the PVC of the flange part of the component will flow outwards. Finally there is a short cooling time for the molten plastic to solidify before the electrode can be removed from the combined component and foil. Carmo supplies electrodes for each of our weldable componenents and a series of machines for automatic welding of eyelets. The great advantage of HF welding is the speed of welding: The material is heated from the inside and fuses quickly, within few seconds. Compared to high frequency welding, a lot of other methods (hot air, infrared radiation, laser) the energy /heat is supplied from the outside. This means that the heat must first penetrate the material in order to heat the contact-surfaces, thus risking to burn the top layer of the welded material. You could compare this to heating your food in the microwave oven vs in a traditional oven. Why use PVC and plastic eyelets? Carmos HF weldable plastic eyelets are strong, flexible and do not rupture. We blend the right composition of raw materials to meet your specific demands for performance, weather conditions, UV radiation exposure, etc. Compared to metal grommets, welded plastic eyelets will fuse together with the foil and result in a joint that is significantly stronger and can withstand significantly higher pull forces. This is especially true when working in mesh materials. the only solution for single layer vinyl. “Invisible” placement of eyelets on the back of the banner is possible. Depending on the application, Carmo PVC eyelets can be used in both single-sided and double-sided configurations. By welding a plastic eyelet or PVC eyelet to each side of the foil, even higher pull forces can be sustained. Depending on the application, up to 3x pull resistance can be obtained. Single sided eyelet welding offers quick insertion and welding and the possibilities to hide the eyelet from direct view – especially useful in high-quality banner production. Double sided eyelet welding offers maximum strength and durability – especially in mesh materials.